When cooking, there are constant dangers all around you. One of the most common injuries is when an object slips or moves suddenly when you could be cutting or hot utensils and pans, which can burn you or damage the worktop it is placed upon. Tenura anti slip mats can be placed on any dry, flat surface to create a non slip, heat proof area for chopping boards, mixing bowls and hot trays and pans. A clean and dry worktop is required for the mat to have a good bond. Once placed down, Tenura mats will create a strong non slip surface which will prevent any slips or heat damage for the objects resting upon it. 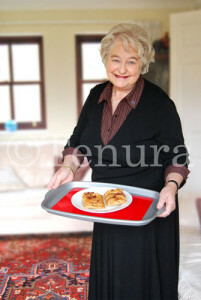 Tenura table mats can also be applied to the common dinner tray, preventing unwanted movement and therefore spillages. 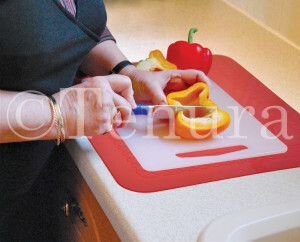 Tenura anti-slip mats are a great surface to rest a chopping board on, helping to prevent all movement from the chopping board,­ reducing accidents. Many chopping boards are still without a non slip base,­ incre­asing the risk of slips and inju­ries.,­Tenura kitchen mats reduce the possibility of this happening.­ Anti-slip mats are also a great surface to use when using a mixing bowl, preventing movement which could create mess. For those who suffer from hand impairments and joint diseases, holding on to a mixing bowl or chopping board while using them can be very difficult and if unwanted movement is possible it can make the whole experience more dangerous. By having a non slip surface, more control and safety can be applied to the task in hand.­ Tenura anti slip mats can also be used in the cooking process, withstanding temperatures up to 250 ̊c means they are perfect for resting hot bowls, pans and plates on with no worry of heat damage. Tenura Anti slip mats will prevent the pans, bowls or plates from being easily knocked and spilling, preventing injury. Tenura kitchen mats can also be used in a commercial environment such as a busy café, restaurant, or kitchen. Tenura anti-slip mats will provide a strong and hygienic non slip surface perfect for almost any task in the kitchen. Tenuras silicone products are anti-microbial, meaning that no dirt or bacteria can grow or harbor on them, this ensures a clean surface which can easily be washed if dirt is present. Tenura understands the levels of hygiene that need to be followed in commercial kitchens, which is why our rectangular mats are made from non-toxic materials meaning no chemicals can leach into any food being prepared on the mats surface! Tenura anti slip mats are available in sizes of 25.5cm x 18.5cm, 35.5cm x 25.5cm and 45.5cm x 38.5cm and in the following colour options; Red, Blue and Yellow and are available to purchase direct from the website now. Free shipping is available on all order over £35 and if you are VAT exempt, you can fill out the VAT exemption form on the site. Posted in Assisted Living, Daily Living Aids, Independent Living, Internet, Tenura Updates and tagged anti slip mats, kitchen mats, table mats, tenura, Tenura anti slip mats, tenura table mats on 22nd June 2015 .